“Who would have thought a means of communication limited to 140 characters would ever create misunderstandings?” That was Colbert talking about the flap over his supposedly racist comment which was tweeted without including the set-up to the joke. This is a perfect demonstration of what I was talking about a month ago—that our ABT Universal Narrative Template shows a natural tendency to need about 300 characters to create a sentence with a clear narrative structure. Tweets were set at 140 characters for technological reasons. It sure looks to me like a case of technology leading us in a stupider direction overall. 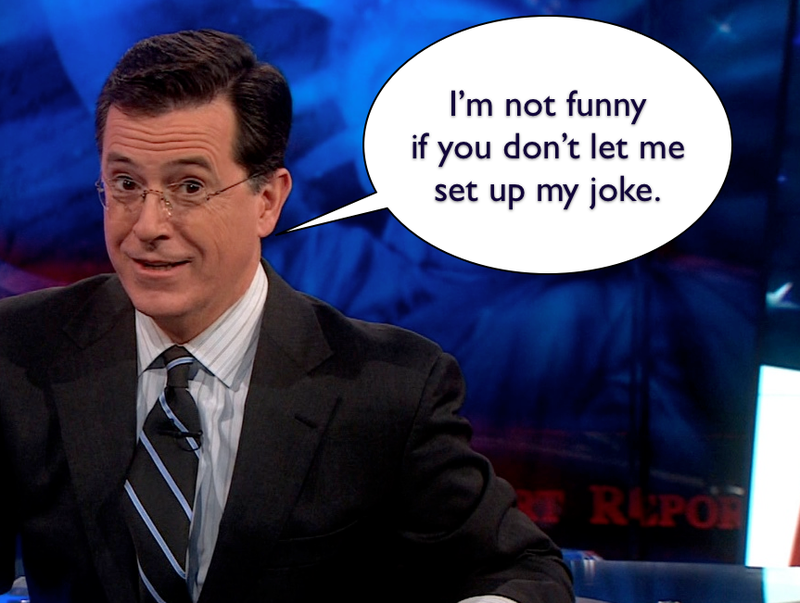 As Colbert has discovered the hard way. TWITTER SHOULD HAVE BEEN 300 CHARACTERS. That’s what our ABT findings are telling us. There was never a discussion about the length. Everybody got stuck with it, and now assumes it’s perfect. Until they get burned by it. What would have been the perfect length for Tweets? As I discussed in January, the length of Twitter was kind of just thrust upon the world by the technicians who designed it. There wasn’t a vote or a big study in narrative structure to find the optimal length, trading off brevity with clarity. The 140 came from text messages which are limited to 160. People have a tendency to not question the existing world, and to assume that if something is sub-optimal in design it will naturally change itself to find the optimum. Who knows for Twitter. Maybe 140 characters really is the absolute optimum for effective rapid fire mass communication. All I know is that we’re gearing up to run our Connection Storymaker workshop next week with Deloitte Touche in Boston. We’ve got the participants sending in their ABT’s. And once again, they are all in the 300 to 350 range. I’m tellin’ ya, there’s something to this observation. People need 300 characters to tell a clear, cohesive thought. Maybe they can squeeze it to 250 with editing. Maybe with abbreviations get it down to 200. But 140? Really? I predict something is going to arise to replace Twitter in the not-too-distant future. It will be similar, but will allow for a little more cohesion of thoughts. And will give users the room to include the set-up to a controversial joke (if they want to).